Maria Chávez, born in Lima, Peru, and based in NYC, is best known as an abstract turntablist, conceptual sound artist and DJ. 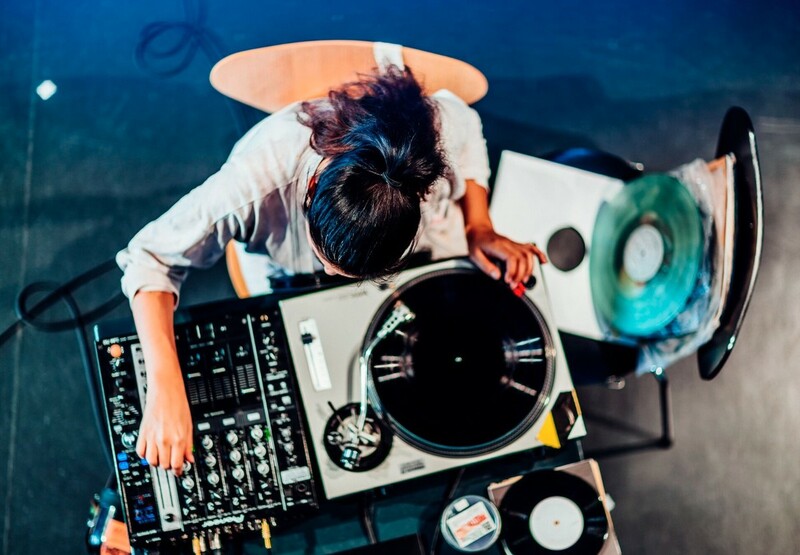 Her improvised solo turntable performance combines recorded sounds from vinyl records with the electroacoustic sounds of vinyl and needle in various deteriorating phases. This raw approach merges the practice of improvisation with the inherent unstable conditions of a turntable, allowing accidents to dictate each sound piece. Her conceptual sound installation practice tends to be site specific, allowing each space to highlight it's own sonic qualities. Her solo exhibitions are often interactive, ranging from spatial sound presentations to turning an entire art space into a gigantic string instrument for the audience to perform. Chávez has been a research fellow of the Sound Practice Research Department, Goldsmith’s University, a composer fellow with Civitella Ranieri in Umbertide, Italy, and an artist fellow at the Robert Rauschenberg Foundation. Her instructional book of essays and illustrations, OF TECHNIQUE: Chance Procedures on Turntable, was published in 2012. She has participated in various artist residencies including the CEC Artslink/Back Apartment residency in St. Petersburg, Kunstmeile Krems sound artist residency in Austria, The Kitchen in New York and the Royal Academy of Music in Denmark. Her work has been exhibited internationally, including at HeK – haus der elektronischen Künste-Basel, INKONST Art Center, Sweden, The Judd Foundation, Marfa, Texas, The Brooklyn Museum of Art, The Getty Museum, Black Mountain College Museum and Documenta14 in Kassel. Her latest solo exhibition, Topography Of Sound: Peaks and Valleys, a painting show about the topography of vinyl records and needles, was recently on view at the Harnett Museum of Art in Richmond, Virginia while her latest 4.1 spatial sound installation, The Center and Periphery, was exhibited in the group show, Soundings, curated by Stephen Vitiello for the Moss Arts Center at Virginia Tech University. Later this fall Maria will be a perform her solo turntablism work for the Le Guess Who? Festival, co-curated by Moor Mother, the Ableton Loop Festival in L.A. along with touring extensively around Europe and the UK. As a DJ, Maria has shared her expansive music collection of techno and house music alongside iconic electronic musicians and DJ’s like; Simian Mobile Disco, Demdike Stare, Powell and DJ Marcelle. She has DJ'd all over the world, most recently in Moscow (Dewars Powerhouse), Lisbon (Galerie ZDB), Basel (Kaskadenkondensator Gallery) and Istanbul (Pendor Corner). Her DJ mixes can be heard via her Soundcloud page along with DJing for radio spots at the Lot Radio (Brooklyn, NY), NTS radio, NNWR (New New World Radio) Moscow and more.